This issue of Interventional Cardiology Clinics, edited by Drs. Dominick Angiolillo and Matthew Price, will focus on Antiplatelet and Anticoagulation Therapy in PCI. 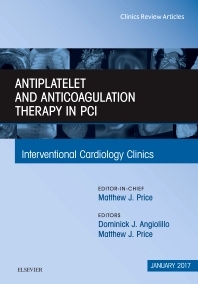 The topics covered in this volume will span across pretreatment with antiplatelet agents; optimal duration of antiplatelet therapy after PCI; Cangrelor and its role in percutaneous coronary intervention; Ticagrelor and its effects beyond the P2Y12 receptor; dyspnea and Reversibly-binding P2Y12 antagonists; PAR receptor inhibition post-PCI; switching P2Y12 receptor inhibiting therapies; antiplatelet and antithrombotic therapy in patients with atrial fibrillation undergoing coronary stenting; antithrombotic therapy to reduce ischemic events in ACS patients undergoing PCI; and the current role of platelet function testing in PCI and CABG, among other topics.